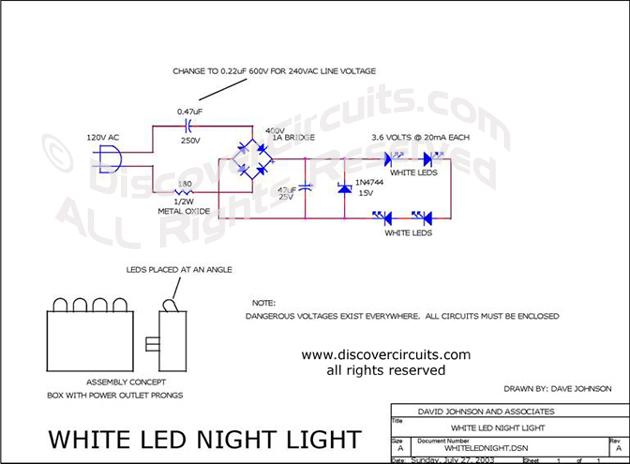 Circuit: WHITE LED NIGHT LIGHT__ Circuit designed by David A. Johnson, P.E. This simple circuit is designed to plug into a standard AC electrical outlet. It uses four super bright white light emitting diodes (LED) in conjunction with a capacitor coupled full wave rectifier circuit. The LEDs are mounted in a box and are angled slightly to bounce the light off of a nearby wall. The light should last about 10 years. The circuit draws less than one half of one watt of power and can therefore run continuously. In spite of the low power, the LEDs provide sufficient illumination for most night light applications. Circuit component values for both 120vac and 240vac are shown.